Located around 318 kilometers east of Karachi, the headquarter of Tharparkar, amid the sand dunes lies Mithi – infamous for its droughts and famine and one of the lowest in terms of human development index among Pakistan’s districts. While bypassing the city, towards the Thar Coal Mines, often touted as Pakistan’s solution for its energy crisis, one cannot ignore a sprawling two-storey structure, spread over 89 acres enclosed by a boundary wall and covered in sand. 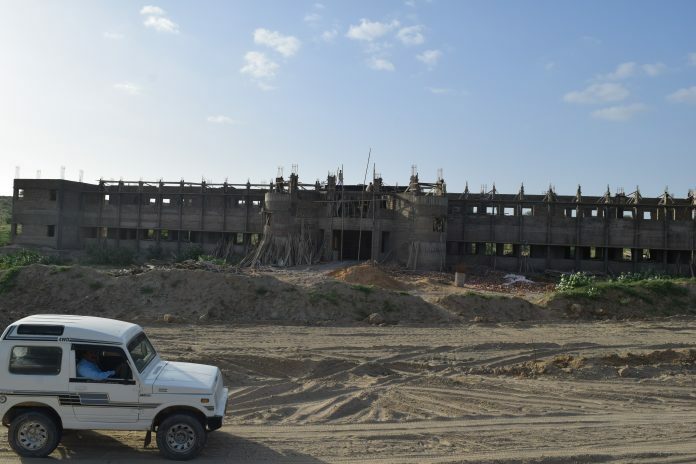 Neither an office for the Thar Coal project nor housing a well-funded NGO devoted to improving the lives of the Thar’s marginalized communities, it is Cadet College Mithi – under construction since 2012, yet barely accessible by car to this day. Once complete, this project boasting of four playing fields, a swimming pool and a gymnasium, shall lodge 300 resident students. Its completion, however, stays a distant dream, as Profit gathered from its recent visit of the site. Approved as part of the Annual Development Program (ADP) in 2007, Mithi Cadet College was supposed to be completed by mid-2014 at a cost of rupees 492 million. 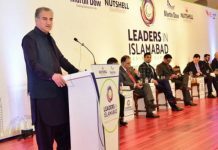 While funds for the project were released year-on-year since 2012, despite Rs132.32 million already spent on the project, come 2017 it is said to require another two years at the least – with the fruits of last five years of labour only yielding the 8-class room academic block and the boundary wall. For the institution to be functional, the residential block for the students and the faculty need to be complete, which would take two more years. Meanwhile, the cost of the project has increased by some Rs500 million – taking it to Rs993 million. Cadet colleges are amongst the very few government-run educational institutions that are successful. Their reputation for imparting quality education and instilling a sense of discipline in its pupils inspires the elite to send their children to cadet colleges. No doubt cadet colleges have played an important role in producing highly disciplined, committed and useful citizens of the country. On top of it, these colleges have their own micro economies and play an important role in the uplift of the area where they are built, usually suburban or rural areas. The people of the area get employment in one form or another in the institution and also many day to day necessities like milk and meat are procured from the nearby farmers. Furthermore non-skilled jobs like watchmen, bearers and cooks also go to the locals. Education is billed as one of the Sindh Government’s top priorities, manifested in the appreciable increase of 24% over the last year’s budget, it is also the highest in terms of resources allocated to any department. To put it into perspective, the outlay for the year 2017-18 is equal to 74 percent (Rs276.4 billion) of the Balochistan government’s budget. Though education gets a fair amount of funding from the Sindh government, at the least this is what the numbers reflect, where and how the funds are used is altogether a different question. The education department has long been marred by allegations of corruption and misappropriation of funds. With Cadet Colleges being credible entities, it may be the reason why the incumbent Sindh government since coming to power announced establishing many in different parts of the province. Some of these have been completed while others are said to be ‘work-in-progress’, albeit at a very slow pace for the last many years, adding substantially to the overall cost of the projects as the estimated costs of setting up the colleges are revised and re-revised each year. Interestingly, the Mithi Cadet College is not the only one that has suffered, almost every other project that has been approved and for which funds have been released under the ADP has hit snags. These include: Cadet Colleges at Khairpur, Dadu, Karampur (Kashmore), Jacobabad, Nawabshah and Larkana . The last two, at Larkana and Nawabshah are meant to be set up for girls. Named after the daughter of Pakistan Prime Minister Benazir Bhutto, Bakhtawar, the first cadet college for girls at Nawabshah is estimated to cost Rs1.89 billion. Around Rs957 million have already been spent, and its financial progress up to June 2017 is 66%. The college was slated to start functioning by 2013, but it started off only recently with the induction of the first batch of students in May 2017. Had the project been completed on time, its cost to the exchequer would have been Rs885 million, thus saving the Sindh government a neat one billion rupees in this project alone. To be set up in Larkana – the home to the Bhuttos for generations, whose PPP has been in government in the province for 10 years on the trot, the work at the second cadet college for girls was approved in 2011. The project has not moved an inch in the last six years. Part of the Sindh Public Sector Development Programme since 2009, and scheduled for completion in 2013, Cadet College Kaker at Dadu had to set back the provincial exchequer by Rs450 million. Its after-revision cost in 2016 was Rs813 million, an addition of Rs363 million. With Rs243 million already used up, up to June 2017 only 35% stands completed. Approved in 2011, Cadet College Khairpur was to cost Rs600 million, but the last year’s upward revision added to it one and a half time, another Rs900 million taking it to a whopping Rs1.5 billion. An outlay of Rs175 million has already been spent while another Rs194 million has been allocated for it this year. Establishment of Cadet College Jacobabad was approved in 2013 after a feasibility study conducted the same year. The project’s cost was revised and another Rs500 million were added to its cost. The project is nowhere near completion and would require another 3-4 years owing to the negligence of the government, resulting in raising of the cost of the project. The Cadet College Karampur at Kashmore – expected to commence classes by next year – has been completed on time, yet the overall cost has bloated to almost Rs1 billion, Rs488 million added to the cost from initial estimates. Cadet College Gadap, a project set to commence in 2005, has been completed recently – a full one dozen years late, with Rs800 million added to its initial cost! Another alarming point to note is: the cost of establishing Cadet Colleges across the province has seen jacking up. Here is why. Once a project is put on the ADP, no funds are released for a couple of years. 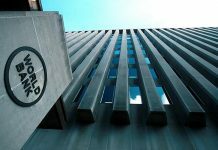 Only after a revision of costs owing to inflation – usually a Rs100 million spike – it proceeds at a pace slow enough to require an upward revision of the revision in its outlay, bloating the overall expenditure beyond comprehension. What is worrying: the pattern is similar in all Cadet Colleges projects, even those that have recently seen completion! A gross and deliberate mismanagement of public funds and a disregard for the taxpayers’ hard-earned money? 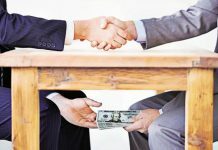 Mega corruption scandals have been in the news lately and rupees 5 billion may not seem like a huge amount to some and to make the readers aware of the huge amount, we can compare it to the cost of the Karachi-Hyderabad motorway (M9) which is a 134 km road with 11 bridges and 8 interchanges. The cost for the completion of the M9 is rupees 3.1 billion. Meanwhile, back in Mithi the on-site representatives of the contractors, besides complaining about the extreme working conditions and the desert heat, alleged that non-availability of electricity and technical labor locally must also be taken into account for the delay. Despite many requests, the contractors lament, with the near-city site of the Cadet College taking access out of the equation, the electricity connection had not been provided. Despite repeated efforts to contact the Secretary College Education Sindh, on his cell phone the secretary chose not respond to our queries on the subject.